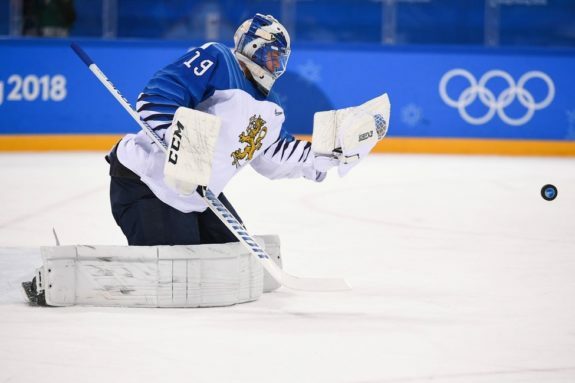 The recent rumors around the Edmonton Oilers potentially signing Mikko Koskinen brings forward some interesting questions about the goaltending depth chart heading into 2018-19. Edmonton currently has six goalies in the system signed to pro contracts for next season. If they sign Koskinen, and last year’s third-round pick (Stuart Skinner), it’ll be a packed depth chart. Something will have to give, especially with their only being six spots spread across the NHL, AHL, and ECHL for next year. 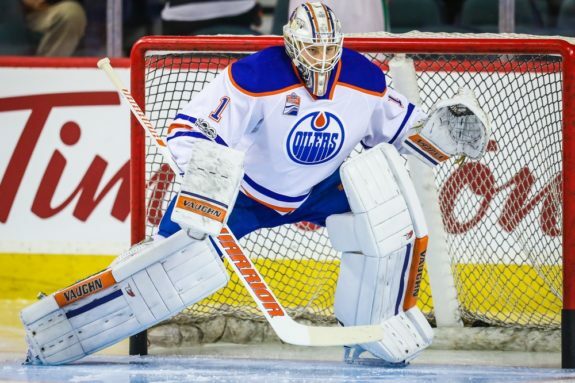 The obvious is that Cam Talbot will be returning as the starter. After that, there are a few dominoes that could fall along the ways. Remember Edmonton will probably want to give their two developing youngsters in Dylan Wells and Skinner meaningful minutes. Here’s what the Oilers current depth chart looks like going into 2018-19, and what a potential Koskinen signing means for the organization. The Oilers starter has been an absolute workhorse, and the busiest goalie in the NHL over the past two years with 140 games played. The next two closest goalies to that total are Frederik Andersen (132), and Sergei Bobrovsky (128). The logic behind a Koskinen signing, if everything goes according to plan, would give Edmonton a backup that can play 20-25 games. Talbot’s workload would lessen, and the team might possibly get some more meaningful starts out of him. Across the NHL teams are lessening the workload on their No. 1’s, and trusting their No. 2 goalies more. The question though is if Koskinen truly is a better answer than Talbot’s previous backups like Anders Nilsson, Al Montoya, Jonas Gustavsson, and Laurent Brossoit. Remember, this is all ifs, buts, rumors, and thoughts. This signing isn’t official yet, but the domino effect is worth talking about. Best case scenario, Mikko Koskinen comes in next season, knocks it out of the park, and gives the Oilers something they haven’t had in years – consistent backup goaltending. Worst case scenario, he ends up being what Anders Nilsson ended up being a few years ago. 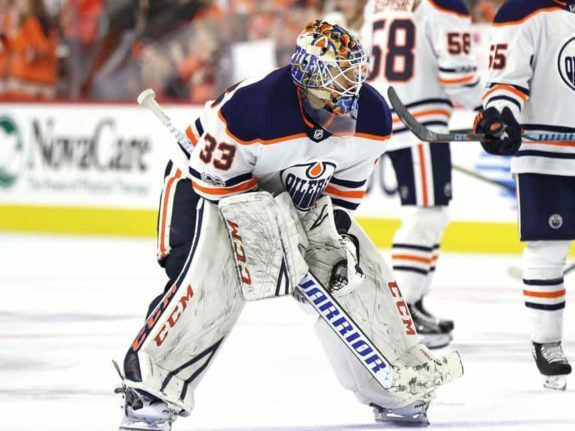 If there’s one thing we’ve learned about Oilers head coach Todd McLellan is that he trusts Cam Talbot. Who he hasn’t trusted are his backups. Koskinen will have to show early consistency to earn McLellan’s praise if he is to be here next season. Otherwise, he’ll end up riding the bench and be a very expensive guy to have on the bench to chew bubble gum and wear a ballcap on television. If Koskinen falters, good luck trying to trade that contract. There are a few scenarios that could unfold with the Oilers current No. 2 Al Montoya. The first scenario is that the Oilers put Koskinen and Montoya into the same scenario they did with Anders Nilsson and Ben Scrivens heading into the 2015-16 season. Both Nilsson and Scrivens battled for the backup job behind Talbot, with Scrivens eventually ending up in the AHL. The same situation could unfold with Koskinen and Montoya. If Montoya ends up in the AHL, it would create a logjam among four goaltenders vying for minutes. Someone would have to go. Another scenario is that Edmonton tries to shop Montoya in the coming months, hoping someone will take the 33-year-old and his contract. It wouldn’t fetch the Oilers much value and it’s one of those take what you can and run. The last scenario is a buyout which would cost the Oilers $375,000 in each of the next two seasons. Laurent Brossoit has played all but two of his 144 AHL games in the Oilers pro system. For years he was pegged as Edmonton’s heir apparent, but he’s been slow to make the full-time jump to the NHL level. 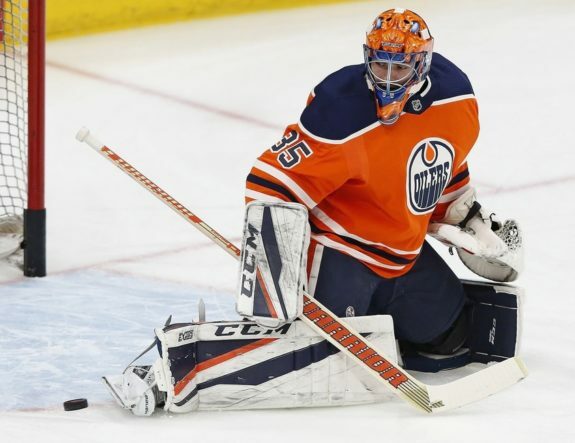 In 28 games with the Oilers, Brossoit holds a 2.98 goals against average (GAA), and a .897 save percentage (SV%). He was handed the backup duties this season, but struggled, and ended up in the AHL midway through the year. Now comes the tough part. What do the Oilers do with Brossoit? If he returns, he’s the de facto No. 4 goalie on the depth chart (if Koskinen is signed). From Brossoit’s perspective, it hasn’t panned out, and it might be time to pursue another opportunity, especially one that puts him back in a spot to battle for an NHL backup job. It’s likely there’s a parting of ways between the two this summer, and the Brossoit experiment will officially be over. 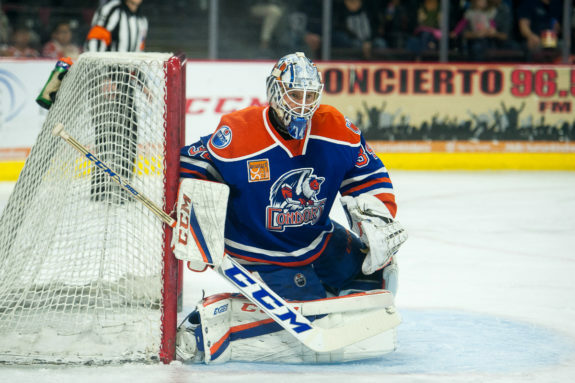 If the Oilers end up trading or buying out Montoya, and then letting Brossoit walk via free agency, Nick Ellis will return as the starter for the Bakersfield Condors. He essentially becomes Edmonton’s No. 3 next season and will be right on track with projections. A lot of folks had him vying for NHL minutes by the time his third year rolled around, and he’s that much closer with Brossoit out of the picture. Ellis had an extraordinary rookie pro season but showed some regression as a sophomore in 2017-18. His 3.21 GAA and .898 SV% left more to be desired by the organization, and he saw some time in the ECHL as well. Edmonton will likely get a better idea of what they have with Ellis with his third and final year of his entry-level contract (ELC). Right now he projects as an NHL backup, and on the low side, as an NHL No. 3 option. Shane Starrett finished his first pro season in the ECHL this season. The 23-year-old posted a 3.04 GAA and a .912 SV% in 38 games and had a respectable playoff performance. Starrett appeared in just three games in the AHL, but if things break down the way it’s looking, he could end up being a backup in Bakersfield next year. Just a year ago he was coming off winning the NCAA’s AHA Championship with Air Force Academy. There’s promise in the 6-foot-5, 194-pound goaltender. He was a great NCAA signing that has limited NHL upside, similar to Ellis. It’ll be interesting to see what he can do next season with stiffer competition all while splitting the duties (more or less) in the AHL. Edmonton’s typically seen their farm goalies split starts at 50:50 or 60:40. So seeing Starrett play 25-35 games in the AHL next season wouldn’t be a surprise. Stuart Skinner turns 20 on November 1 which makes him eligible to play pro next season. As THW’s Larry Fisher puts it, there’s very little for Skinner to prove in junior after have a superb season in which he’s backstopped the Swift Current Broncos to the WHL’s Eastern Conference Final. Before this season is over, we could be talking about the Oilers 2017 third-round pick leading his team to the Memorial Cup tournament. Of all the Oiler prospects in the system, Skinner likely possesses the highest upside, and could actually become the Oilers heir apparent. One knock on him was his level of consistency, and he’s found a way to fix that, especially after leaving the Lethbridge Hurricanes. The 6-foot-4, 207-pound goaltender moves quite well for a big man and is positionally sound. All that’s left is for Edmonton to finalize his ELC this summer. 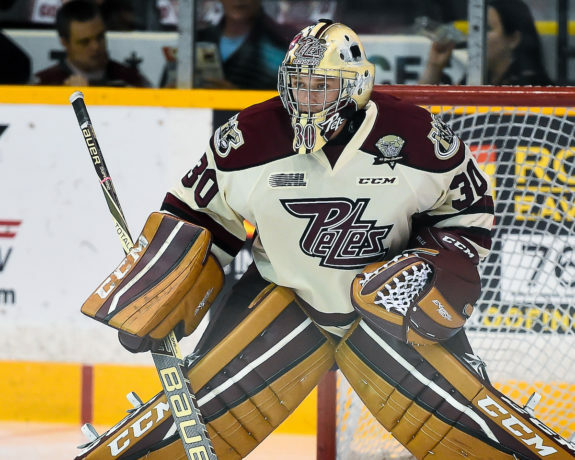 Dylan Wells has already turned pro after the OHL season concluded and the Peterborough Petes didn’t qualify for the playoffs. He wraps up his four-year junior career with a 3.65 GAA and a .898 SV% in 162 games. Going into this season, most were split on whether Skinner or Wells had the higher potential. Right now it looks like Skinner projects better than the Oilers 2016 fifth-round pick. Wells’ game is still under development, he’s got to work on his positioning, a knack for allowing some soft goals, and overall consistency. He played for a subpar Petes team in his final year of junior, so take his numbers this year with an asterisk. He’s appeared in one ECHL game this year. Next year expect him to essentially split the ECHL duties as the Oilers try to get both their draft prospects meaningful minutes in the pros. Can Wells rebound as a prospect? We’ll find out in 2018-19. He still has NHL upside, but he might be on a longer curve than Skinner at this point.